Showcasing one of his most famous murals, this wonderful Banksy Thug Flowers Sofa Cushion is a beautiful way of showcasing an appreciation for this renegade artist. The message itself is very unique and the presentation, in sofa cushion form, is a real treat. In fact, it's a great way to add interest to an ordinary couch, chair or even bed. 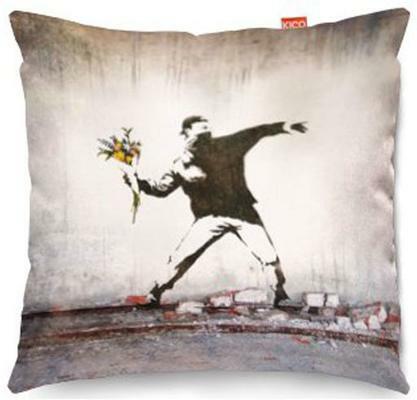 The cushion features a man or a rioter throwing a bouquet of flowers instead of damaging items. It's a wonderful statement and one that surely makes you think. These pillows are well made and hand crafted in the UK using fine faux suede. It comes in two sizes so pick the best one you're comfortable with and enjoy.